If Elephant Hide is the Mega Star of the paper world, then Tant is the solid all-rounder, second in command, ready when needed. Made in Japan by Hokuetsu Kishu Paper Co. and distributed by Toyo Co., this may be the most versatile paper for origami uses. Little is known about this paper, but we do know that the pulp for it is either imported to Japan from the USA and Canada or made in Japan from Australian Eucalyptus Wood. It is then dyed and shipped to Toyo Co. to be cut, packed and sold. The paper is not acid-free! Good for almost every kind of folding, it is light-weight with relatively high strength, an amazing color palette, and a large variety of sizes. This is an origami paper made for origamists, and it even comes with diagrams for a variety of models. Thickness: Strangely enough, we have few reliable numbers here. The Japanese manufacture says it's 70 GSM, whereas Origami-Shop.com, the only store that provides this information, states 78 GSM. So we decided to weigh it ourselves. The 100 pack of 15cm×15cm yielded 81.7 GSM, and 30 sheets of 35cm×35cm came out as 80.7 GSM. And it does feel like an 80 GSM paper to the touch! Sizes: From 7.5cm×7.5cm, up to a unique 110cm×80cm, with 15cm×15cm and 35cm×35cm options in between, the spectrum of sizes is fully covered here. Perfectly planned to cover all possible needs. Colors: The palette is huge - you can have a 100 colors pack, all of size 15cm×15cm, but then there is only one sheet of each color. For a multi-colored modular, you have a better option: 48-sheet sets, of all blue, red, green or yellow, with each set containing 12 varieties of those shades. For the bigger sizes, the color palette is reduced to 12 colors, with very bright and dominant hues. All papers are colored the same both sides. 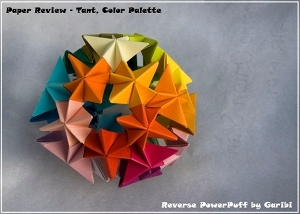 Reverse PowerPuff by Ilan Garibi - The vast palette allows this wonderful rainbow of colors. 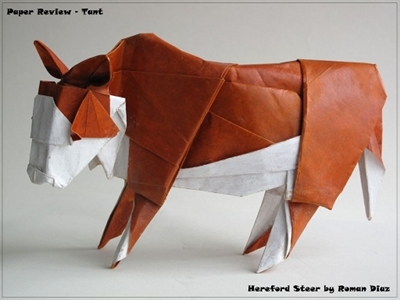 Hereford Steer by Roman Diaz - The white Tant was colored by Ecoline (made by Talens), using a brush dipped with a small amount of ink, to prevent the seeping of the color to the paper's backside. Color the paper with soft pastel, evening it with a cotton pad and stabilize the color with fixative. With this method you can obtain a matte finish with a fine texture. If you spread a thin surface of soft pastel, the color of the paper affects the final color, so make sure to use a thicker layer to avoid this problem. To obtain a more dominant color, brush the paper with a water-based ink (preferably Ecoline, manufactured by Talens). When the paper dries, flatten it by inserting it between two Duplex boards weighted with heavy books. 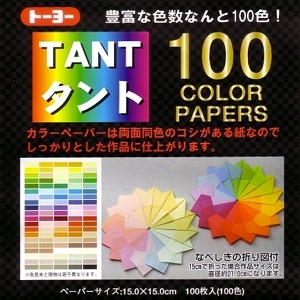 By coloring a white Tant you obtain the true color of the ink, but since the ink is somewhat translucent, coloring colored Tant changes the final result. Texture: Well, it's almost like describing the taste of chocolate… The surface is gentle, but rough to the touch. The texture is a solid color, but if you look closely with some back light you can see the grains swimming all over like tiny fish. As an example, see the fibers stand out like hair in the detail o f the pegasus head. With back-light, light colors have some transparency, just like Elephant Hide. Darker colors have the effect of deep, blazing light, spreading through the paper. Bottom line – beautiful! Photogenic: With bright, strong colors and an interesting texture, this is a great paper for digital imaging. Using a flash brings no reflections, and close-up images look great! I love to match the color of the model with a complementing background color, so the variety of colors for 35cm sheets is satisfying. Yes, Tant is an attractive paper! 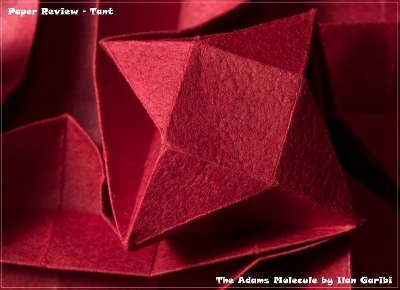 Adams Molecue by Ilan Garibi - Tant texture is slightly rough to the touch. Aging and Wear and Tear: This paper last for years. I have a tessellation I take with me to demonstrate: "this is one sheet of paper". I flatten the corner, and then collapse it back. It's still in good shape after more than two years. The color does not fade and the shape holds firm. The down side here is its poor resistance to tearing - the paper is torn a bit too easily, with or against the grain. Memory: Like an elephant! Once you made a crease with your fingernails, it holds strongly and becomes easily visible. 9 out of 10. Forgiveness: Reversing a fold is easy, no matter if you go with the fibers or in perpendicular to them. It's easy to correct a fold, even if it's just a millimeter aside. Score here is 8 out of 10. Tensile strength: Tensile strength is the maximum stress the paper can undergo while being stretched or pulled. The paper has medium strength, like printer paper. The difference between "with the grain" to "against the grain" is very obvious. To check the strength I used a Reverse Fold test - reverse a mountain fold to a valley, and repeat again and again, using fingernails for a sharp crease. At 9 times it got ripples. At 14 I have started to see fibers coming out and after 43 times the paper gave up. For comparison, a Kami was rippled after 9 times and tear apart at 27 times. EH rippled after 90 times. 6 out of 10! Bending resistance: Bending resistance relates to the amount of force required to bend the paper. This is a weak point. Although in the PowerPuff module the puffing part holds strongly, this paper is lacking the dexterity achieved with EH. While collapsing a tessellation, instead of snapping into position, it just crumpled to a mess. 5 out of 10. Origami-Shop.com (France) is the main source with squares of up to 70cm side length. In the UK there is Origami Papers UK, with limited options of 15cm. You can get all but the big sizes at Kim's Crane (USA) internet shop. OrigamiUSA's TheSource has 6in and 12in squares on offer. 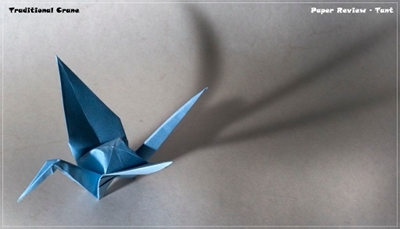 Traditional crane - Accurate folds can be achieved easily. The Crane from a 15cm×15cm square. It was a pleasure to fold. The weight of the paper allows accurate creases with little effort. The square is perfectly cut. Nothing to complain. The result is very nice and shaped easily. This paper is too soft for the dog. After playing a bit with the model, all creases needed reinforcement. The pull mechanism of the flapping bird works nicely. The wings stand firm and in position when untouched, and the flapping action is even with full movements up and down. The frog jumps a distance of 30cm to 50cm and summersaults two to three times. It is an average performance for this action model. PowerPuff by Ilan Garibi - Tant is highly recommended for Modulars. This is a perfect paper for modular work and particularly for this model. Puffing the units was easy, thanks to a surprisingly high bending resistance. The paper is also strong enough to hold a structure of 30 units and at this size it was very easy to get very accurate folding. The roughness of the surface creates a lot of friction, and the color palette allows having beautiful combinations. This is definitely my preferred paper for modular! Icarus Cube by Dave Mitchell, 6 units, 10cm×10cm. 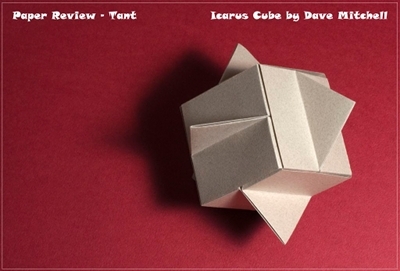 Icarus Cube by Dave Mitchell - Friction is relatively high with Tant. The paper surface is attractive for this model. And it holds the cube closed very well. 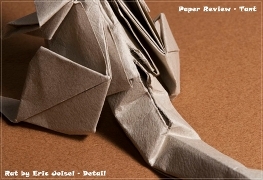 This paper is great for tessellators, almost perfect, but there are some limitations (see Mystery section). It is very easy to fold a very accurate grid; no real pressure is needed to make a sharp crease. Reversing a fold to make the grid bi-directional is again, quite easy, and the paper breaks on the right place with just a little pressure. Pre folding is very clean, where short fold lines have little effect on the surrounding surface, so the final result is quite clean. This paper is not as strong as EH, which does make lesser stress on the fingers. With around 80 GSM, the thickness of the paper is great for multi layers, and it's still easy to fold 3 and even 5 layers together as can be seen in my variation of the Pineapple tessellation. 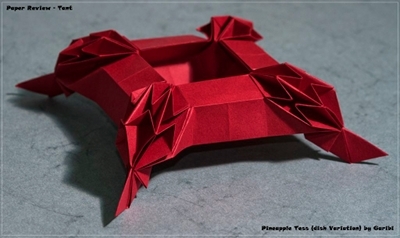 Pineapple Dish by Ilan Garibi - The paper is thin enough to easily fold many layers. 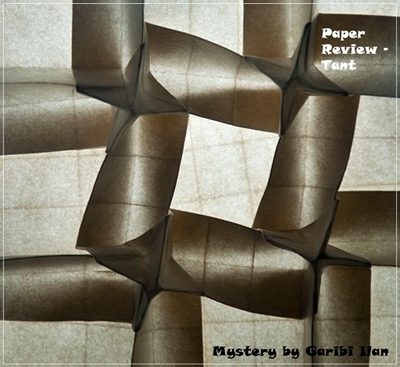 Mystery Tessellation by Ilan Garibi - Great light effects can be achieved. Mystery tessellation shows the limitations of Tant. I tried to make it from a full scale paper (110cm×80cm), with a 48X64 grid. For this model there is a twist fold that requires a lot of bending resistance. With EH, the paper just snapped into position. Here the Tant crumpled under the pressure to a degree that could not be handled. I had to give up on this model at that size of a molecule (about 2cm). Nevertheless, I needed this pattern to show the transparency effects, so I have folded it from a 15cm paper, with 16×16 grid, making only 4 molecules. At this size the paper behaved a bit better. As mentioned before, back-lighting works nicely with Tant, even with the darker colors such as red and blue. 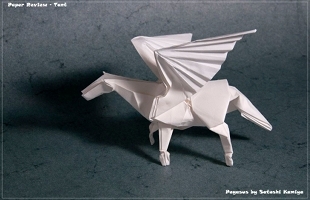 Pegasus by Satoshi Kamiya, 25cm square - With the recommended size Tant gives good results. One of this paper advantages is its memory - how it holds the creases. But with multi-layered models it becomes a disadvantage! 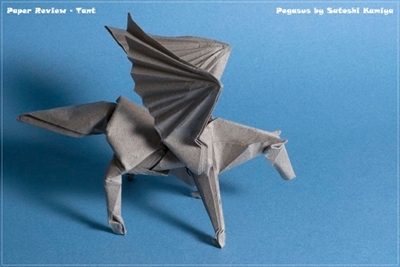 Since it is relatively thick, flat surfaces become rippled as can be seen on the neck of the Pegasus. Although the folds hold very well and the final model looks nice, I strongly recommend using thinner paper for complex models. Unlike Elephant Hide, which gave me a fight, Tant is much more responsive. The creases went smoothly, no need for more than my fingernails to stabilize the creases. At 35cm the details are nicely formed, although making the wing and reverse folding the legs was a little struggle. Again, I failed with the details of the legs; I couldn't make the hooves to be acceptable, there are too many layers for this thickness of a paper. 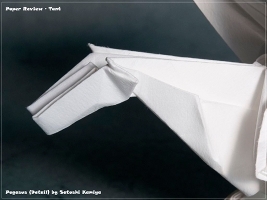 Pegasus by Satoshi Kamiya, 35cm square - Tant softness allows easy sculpturing of the wings. Fibers are coming out on the neck. The Rat mixed straight lines with curved ones. I tried to make it more curved by wetting the model. Unfortunately, the Rat's back tore! The paper is too weak. To shape the tail I didn't need to wet it even a bit, and just by rolling it on my finger it shaped well. The ears shaped easily by pinching them in the centre. 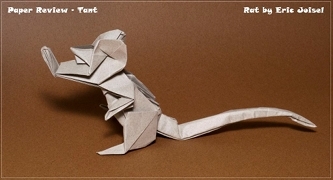 Rat by Eric Joisel - Curved line can be achieved without Wet Folding, but the paper is not strong enough for many layers to be fold together. 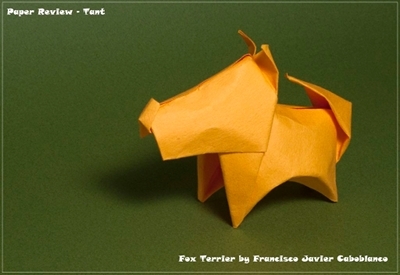 Fox Terrier by Javier Caboblanco - Tant is too thin to be wet-folded, although results look nice. For wet folding, I wetted an 18cm square which had a small effect on the proportions of the paper, so the Fox Terrier didn't suffer for it too much. At the end the model was nice but wet and soft. I had to watch it while it was drying to reshape it till it dried. The final model is nice and shaped, but it feels too soft. My expectation from wet folding models is that the final dry model should be hard. I can't really recommend using this paper for wet folding, although it looks fine and holds its shape; I still don't like the final result. What is it good for? For traditional use it is great. If I could afford it, Tant would be my only paper for simple 2D models, it's pure fun paper. For tessellations it is more than suitable, but do bear in mind its relatively weak bending resistance. For 3D models, it's good, but for wet folding it is too thin. 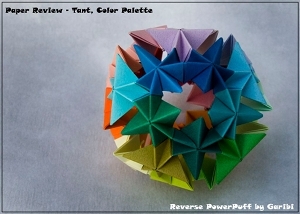 Complex models will get a good result if you choose big enough paper and there's a great color palette to choose from. 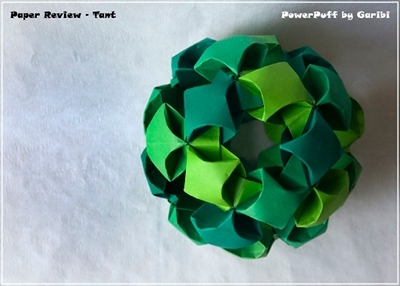 The variety of small sizes, the friction and paper texture make Tant perfect for Modular Origami. This paper is not to be wasted on action models. 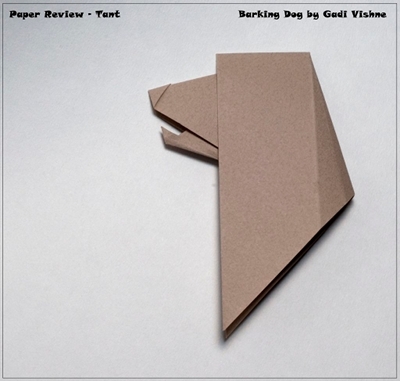 This is highly versatile paper and is recommended for both beginner and advanced folders. Going through Flickr search engine after Tant images, I got around 415 images. The majority (220) is 3D models, including complex and high intermediate models. Surprisingly, modulars are only 10% and tessellations covers 25%. Bottom line: Recommended for all folders, best for modulars.